The Alfa Romeo Twin Spark (TS) technology was originally developed by Alfa in the early 1960s in their race cars (GTA, TZ) to enable it to achieve a higher power output from its engines. And in the early and middle 1980s, Alfa Romeo incorporated this technology into their road cars to enhance their performance and to comply with stricter emission controls. The TS series engines are all '4 cylinder inline' with twin cam (DOHC) shafts, and are developed first with 8 and later with 16 valves. All cars featuring the Twin Spark engines since the Alfa Romeo 155 (which originally also came with the 8V unit) use the 16 valve models over the 8V ones. The Twin Spark name comes from the fact that there are two spark plugs per cylinder. The two sparks on the early Alfa twin spark engines fired on the power stroke to help create a larger flame front ensuring less unburnt fuel in the exhaust as well as a higher thermodynamic efficiency. The 8V units have 8 identical spark plugs, while the 16V ones have a larger and a smaller plug in each cylinder. On the later 16v TS engines the smaller plug ignites on the exhaust stroke to reduce emissions. The common TS 16V engines, 1.6, 1.8 and 2.0, all use a 10 mm diameter and a 14 mm diameter plug per cylinder. TwinSpark EngineThe engines also incorporate two devices to improve the performance under normal operation, the Camshaft Phase Variator and the air intake Variable Inlet Control on the two litre version. : zbog čega neki automobili imaju dvije svijećice po cilindru? znatno kompliciranija i skuplja od klasične te se rijetko koristi. Dvije svijećice su prvi puta ugrađene 1906 g.u Rolls Royce. izvedba sdvije svijećice i četri ventila po cilindru. motora te smanjenju potrošnje benzina i emisiju štetnih plinova. Evo malo objašnjenja za T.S. Danas sam prvi put vidio da su kod TS motora spojene svjećice od 1. i 4. zajedno i 2. i 3. cilindra. Znači kada na 1. cilindru svjećica baca iskru za paljenje smjese, u isti trenutak baca iskru i u 4. cilindru koji je u fazi završetka ispuha (i obrnuto). Znači baca varnicu u ispušne plinove. Koja je svrha toga, meni to djeluje malo suludo? To je samo iz ekoloških razloga. Pali se još jednom neizgorena smjesa. Ja sam ih probao spojit da se pale istovremeno dvije na svakom cilindru. Mislio sam da bi mogao ić malo bolje ali ista stvar. Kad sam ga spojio na eko test rezultati su bili puno lošiji nego standardno ali ne toliko da nebi prošao tehnički. To drugi motori nemaju pa ipak dobro rade. Mislim da je to najviše marketinški trik, imati nešto što drugi nema. Je, noviji TS motori su imali tako da u isto vrijeme recimo mala i velika u istom cilindru pale, bas jednom pitao seb-a ako slobodno stavim da mi se pale u isto vrijeme, jer imam taj stariji TS, pa rekao da nece bit nikakve promjene, sto se tice snage i tih gluposti. nije tako, kada prva svjecica baci iskru druga u neizgorni dio ispusnih plinova baca drugu iskru,malo bolje pogledaj,dakle cilj je veca snaga,bolja iskoristivost smese i na kraju manje zagadjenje!!!! Promijeni termostat i riješit ćeš oba problema. Alfa Romeo Twin Spark (TS) technology was used first time in Alfa Romeo Grand Prix car in 1914. In the early 1960s it was used their race cars (GTA, TZ) to enable it to achieve a higher power output from its engines. And in the early and middle 1980s, Alfa Romeo incorporated this technology into their road cars to enhance their performance and to comply with stricter emission controls. Twin Spark name refers usually engines made after 1986 when the 164 Twin Spark was introduced. The TS series engines are all '4 cylinder inline' with twin cam (DOHC) shafts, and are developed first with 8 valves (an all alloy wet-liner engine, chain driven) and later with 16 valves (a modern iron block engine with alloy head, belt driven). All cars featuring the Twin Spark engines since the Alfa Romeo 155 (which originally also came with the 8V unit) use the 16 valve models over the 8V ones. The Twin Spark name comes from the fact that there are two spark plugs per cylinder. The two sparks on the Alfa twin spark engines fire one after the other on the power stroke causing higher compression as the flame front travels across the combustion chamber. The second spark fires in the extra compressed mix, ensuring a cleaner burn and less unburnt fuel in the exhaust as well as a higher thermodynamic efficiency. The 8V units have 8 identical spark plugs, while the 16V ones have a larger and a smaller plug in each cylinder. On the later 16v TS there are 4 independent 8-ampere coils, connected to plugs; 1a and 4a, 1b and 4b, 2a and 3a, 2b and 3b. 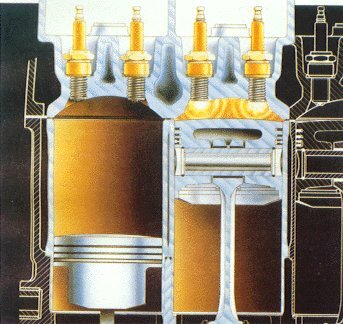 This arrangement facilitates the separate firing of the spark plugs in each combustion chamber, and also saves parts by utilising a "wasted spark" system, where - between the exhaust and inlet stroke of each pistons "partner" - a useless spark occurs, this may improve emissions very slightly, but the intention is to reduce cost. The common TS 16V engines, 1.6, 1.8 and 2.0, all use a 10 mm diameter and a 14 mm diameter platinum electrode spark plug per cylinder. The spark plugs of the 8V TS Alfa Romeo engine are symmetrically located in the upper part of the chamber to the sides of the line passing from the opposing intake and exhaust valves and this allows the usage of larger intake valves due to the missing central spark. Thus the 2L version of the 8V engine uses 44mm intake valve. By firing the spark plugs at the same time and considering their location the burning lasts shorter time (faster burn) because the mixture is ignited simultaneously from 2 different locations. This allows usage of less ignition advance than when using single spark ignition. The engines also incorporate two devices to improve the performance under normal operation, the Camshaft Phase Variator and the air intake Variable Inlet Control on the later (plastic cam cover) 1.8 and 2.0 litre versions. The advancing of the inlet camshaft by 30 degrees (or 15 camshaft degrees) which makes the intake valves open and close earlier, when the predetermined rpm and load range is reached, makes the compression phase of the combustion process to begin earlier than when the camshaft is not in its advanced state and in this way the dynamic effective compression ratio is increased which produces more torque at the given engine speed. Also as the intake valve is also opened earlier the valve overlap is also increased at that mode. On some similar inlet cam phasing systems like VANOS the phasing is returned to the retarded state at higher rpm. 16 valve Twin SparkThe Variable Inlet Control causes the air intake (plenum) to shorten its path from the intake trumpet to the valve bores, again when the engine reaches a pre-defined RPM. This works on the principle that the air intake length is a tuned pipe that when operating at its ideal frequency-in tune with the valves, will allow a smooth and even air flow, and will assist with filling the cylinders efficiently. This works in a similar method to the tuned exhaust system on all modern cars, where the exhaust system creates back pressure to pull spent gasses from the cylinder bores. Modifying this tuned system in any way and failing to re-tune it will create performance drops. The notable effect that these two devices have is that the engine will surge powerfully forward on hitting the ~4300 rpm mark, right up to the RPM limiter. In the lower RPM mode the air path is longer which increases the intake air speed and improves mixing, combustion, emissions and low rpm torque. Variable valve timing gave the Twin Spark engine very good performance for its cubic capacity it is one of the weaker areas of the 16 valve engine. The variator solenoid that controls the cam timing is prone to wear or jam. Symptoms are a slight loss of performance and a diesel type rattle from the top of the engine, which appears at startup and gradually lasts for longer. It is therefore adviseable to get the variator changed regardless of its apparent condition at the 36,000 mile (60,000 km) cambelt replacement. The variator problem is not often seen in the earlier 8V Twin Spark version, as these use a different type of cam timing variator system. Normal engines have one spark plug per cylinder. However, since decades ago, Alfa Romeo insisted to put 2 spark plugs in each cylinder. As ignition takes place in two locations rather than one, this enable more efficient combustion and cleaner emission. However, besides Alfa, in the past 15 years only Mercedes and Porsche have ever applied Twin Spark design to their engines. This is mainly because of the complexity of cylinder head - it would be too difficult to put 4 valves and 2 plugs into the small cylinder head area. ( Mercedes' and Porsche's engines are 3 valves and 2 valves per cylinder respectively, so they have no such problem.) Only Alfa Romeo applied it to 4-valve engines.